Greetings. Just joined the forum. What an amazing source of info! Thanks Ken and Brian for having such a fantastic meeting place for shakuhachi addicts! So here is my dilemma. I've been playing and studying formally for about 7 years. It wasn't until about the fifth year that I really felt I had a grasp on the instrument and actually began to ENJOY it. My tone was rich and I'd get that gratifying buzz, actually feeling the flute vibrate as I played. Oh Bliss! The last 6 months or so however, something strange happened. I just lost my tone! Talk about frustration!!! I'll have a good day here and there but for the most part my playing is CONSISTENTLY weak and shallow with a lot of breathiness to the tone. I'm on the same flutes I always use and have tried everything. Mouth position, flute angle, lip tension and jaw adjustment, etc. It's just...gone....Anyone else ever experience these extended periods and any thoughts on getting past them? Thanks all! It sounds like something an experienced teacher could help you with. 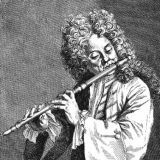 KB komuso, do you get the same outcome on any flute you play (are you playing different flutes) or are you only playing one flute? If only one, is there any looseness in the instrument anywhere (does it have a center joint)? Are there any cracks. Loss of tone and/or sound can result from escaped air at undesirable places. Has any damage or change happened to the utaguchi? This can also cause great deterioration of sound quality. How does the interior finish look? Has it changed? If none of those things appears to be the problem, then Chris' recommendation is well advised. Definitely check your instrument out for leaks etc. If it checks out OK, here's a tip I've discovered that may not be your problem at all but it my be worth checking if you haven't already. If your sound is getting airy and tight(pinched) check your pitch with a tuner. Most of the time I start having sound problems it's because I'm playing sharp. When I bring the pitch down, everything gets more relaxed and the sound gets darker and fatter. It's worth a try if you haven't tried that already. Thanks for the info. I've been studying under Cynthia Nyoen Chaffee http://www.cynthianyoenchaffee.com/ from day one and am old fashioned in my devotion to one Sensei at a time. I did ask her about it and she simply said "play through it". I just was just curious to see if others had experienced such severe and long lasting periods of tone loss. Sorry for the separate responses. I would prefer to quote and answer all of you at once but I don't know how! Funny you should mention the cracks or looseness as it almost sounds that bad! But unfortunately I have checked and all flutes are intact with tight joints. I usually play my 1.8 which is a very fine flute and gives me the richest tone. But nowadays my 2.2 seems to give me the most success. I also play a 2.4 (by Ken and it's a killer flute!). But in general my playing is just weak and breathy all around. My wife suggested the cold, dry NY winter climate may have something to do with it. I was also laid off about 3 months ago and she thinks my mental state is not allowing proper focus. Some things to consider, but my tone started going south a few months before these things came into play. I'll give that a shot today. Thank you all for the responses. I appreciate the input! I wouldn't try this without an expert’s approval; it may weaken the bindings, but Perry Yung and Tairaku suggested pouring water into the bore. I submerged it in a tub of warm water for 10 seconds and the tones were strong and consistent (indicative of a crack), ending a week or two of frustration, thinking I had forgotten how to blow into the silly thing. (Though it's out for repairs, who knows what's going on) I'd imagine pouring warm water into the bore (instead of totally submerging it) would be acceptable with a monofilament or rattan inlay flute. Or is this a last resort? Granted my crack was pretty obvious. Take anything I say with a grain of salt, as I have been playing for a far shorter time period that you, but I find that I tighten up too much as well in the embochure often, kind of like trying too hard. And, there is kind of a negative feed back loop where if I play bad, I become tense about it and try harder to play correctly and as a result play worse and worse. Short of issues with the instruments, this is the only thing in my personal experience that is similar. What about taking a break from it? If you can bear it, put it away for a few days to a week and see if things are better when you resume. Thanks again for the advice folks. Yes putting the flute away for a few days is a good idea. I've done it before with good results. Not only is it a great instrument in it's own right, but I'm pretty sure that learning the essential pitch bending technique (which for me is sort of "swallowing" the note") counts as a transferable skill. Yes putting the flute away for a few days is a good idea. I've done it before with good results. I've tried this with other instruments in the past and gave up on this as a "practice technique" when I came to the conclusion that I wasn't really sounding better after the break, but just focusing more on the good aspects of my playing when I picked up the instrument again. So, my suggestion would be to spend a practice session or two not really practicing, but just noodling, avoiding the problem areas you know exist (for example it's probably a good idea to forget about dai-kan for this), and finding and focusing on the what sounds good about your playing. Downloading the drone that tablaninja posted on the "miscellaneous shakuhachi related" section (under the subject heading "1.8 Practice Drone / Soundscape") and playing with it would probably be a good way to help free yourself from your typical practice routine to do this. After you've convinced yourself that there is some solid potential in the sounds you're getting you'll probably find yourself slipping back into the critical mindset because of the reality that there still are problem areas. Maybe it's time to re-assess your practice routine. Make sure you're doing the long tone exercises prior to working on pieces. I know the idea is to make each tone sound beautiful, and there might be a temptation to hammer away at some of the problem notes, but sometimes it's a better idea to give equal time to all the notes on the flute and let the exercise fix the problem areas over time, at least a few days, instead of altering the exercise to give more weight to the problem areas. The reason for this is that for the most part, each note leads into one another, and to hammer on a particular problem note will give up the benefit of having worked on the preceding notes and isn't as efficient use of your practice time as just plowing through the exercise even though there are some weaknesses. On the other hand, there's a lot to be said about taking a break from practice. Obviously it's helpful if you can't shake the frustration of thinking your playing isn't up to par any other way. But, where taking a break really has merit is when you've been learning too much too fast and you need to give time for your mind to subconsciously figure out what you're asking your body to do. Coordinating your breath with your facial musculature and wiggling your fingers isn't exactly an innate survival skill so it makes sense that you might need to give your mind some time to process what know intellectually in order to help "get it into your body". However, after 7 years of practice, this probably isn't your problem unless you just took a master class or something where you've been given a year of material to work with in the matter of a few hours. Also, I hate to sound like a shill for James Schlefer, particularly since someone already mentioned him earlier, but I discovered his tone workbook a few months ago and have been working from it and am finding it to be a very valuable tool. It's true that most of the exercises I could have made up myself and it's basically just typical silver flute exercises adapted to shakuhachi, but there seems to be something about having them written out and playing directly from the written material that helps me stick to the exercise instead of doing tone exercises from memory and almost inevitably straying from what I set out to do. On top of that, he put in many variations that all complement each other that I probably would not have thought of doing myself. Other teachers may have similar books, or if your teacher has given you tone exercises to practice be sure to write them out and play through them as your teacher suggested. Hey Keyboard Komuso, Great to see you here. from Tokyo on Feb 26th at Tenri in NYC? I know that when I'm in an artistic rut, all I just need a little inspiration to remind me of why I do what I do. Ralph Samuelson is a guest artist that evening and will be playing shakuhachi. Although known as a Kinko Master, Ralph's sound transcends the boundaries of style. It is rich, transforming and inspiring to say the least. I'll certainly be there. Tell him Ambi! Don't be puttin' down the harmonica! We were privy to a fine harmonica performance from Brian at the last Chikuzen Ro Camp I was at. Brian, Have you tried to play Choshi on the harmonica? That's soooo weird.... i've been in the process of recording Choshi for electric guitar. And no i'm not kidding. i've been working on it for a few weeks now. It's REALLY hard. Even though it's slow and lots of sustained notes, i'm trying to match the timbre of different notes to different strings etc... kinda like I and Ro Kan are the same pitch but don't sound the same... i'll post it when it's done.. I'd like to hear it on harmonica though..... a chromatic one should be able to do it..... with all the bent notes etc.... that'd be cool..
keyboard komuso, just one more point I'd like to make about getting a good sound quality is to make sure that your are blowing across the wet part (inside) of your bottom lip as apposed to the dry part (outside) of your lip. If you're tending to blow dry, it can cause the sound to all but disappear. Try it with an E-Bow, and you'll be right. Why would you want to use an E-Bow for honkyoku? E-Bow is the guitarist's equivalent to circular breathing, eliminating the dynamic decay that we rely on for phrasing in honkyoku. If, however, you had a jinashi E-Bow . . .
where would someone find info on circular breathing? I know it is probably an advanced technique but I am intrigued. Here's a hint: Google 'circular breathing'. Also, do a search on this forum's engine for the same thing.